When I noticed that the Park Slope Food Coop stocked Soy Vay Veri Veri Teriyaki marinade in a 21-oz. 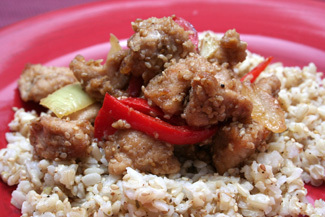 bottle, I knew I had no excuses not to try cooking “Amber’s Sesame Chicken,” from All Recipes. Thi s bottled sauce includes soy sauce, sugar, soy oil, garlic, sesame seeds, and various spices. The marinade helped make this chicken dish sweet and tasty. Chinese five-spice powder smells warm -- like cloves and cinnamon -- as it hits the pan with the chicken. I needed to use 1/4 of a red bell pepper. Follow this recipe and you’ll make perfectly cooked chicken. A great accompaniment to this chicken dish was the “Sesame-Lime Rice” from the May 2008 issue of Everyday Food. I used brown rice instead of white, which took 33 minutes to cook (twice as long as white rice’s cooking time). To boost the sesame punch of this dish, I used toasted sesame oil rather than the suggested safflower oil. I seasoned with 1 1/2 tsp. of salt and 1/2 tsp. of black pepper. My rice was fluffy and bright-tasting, with a welcome sesame crunch. Do you know callaloo? Next time, I want to cook “Skillet Greens with Cumin and Tomatoes,” from the April 2008 issue of Bön Appetit. My greens of choice will be callaloo, which I’ve never eaten before, but couldn’t avoid at the Park Slope Food Coop. What will happen? Return to my site on Monday, August 4, to see my results.